Perfect place,we stayed four nights it was great clean and neat bungalows,chilled out place,short walk to main road and Big C,Tesco lotus,Reastaurents,2-3 minute ride to main beaches Matt was very helpful no need to deal with the hassles in the market for scooter renting,fishing trips etc. Fantastic find .right by the sea ,great hosts ,really chilled out place ..there no stress here ,hosts will leave you alone or sit for a beer and chat ..we were so relaxed when we left . thanks matt your a star ..we will be back sometime ! Had such a wonderful time at Paradise Palms! Stumbled there by chance and felt so lucky to have found such an idilic place. The owner Matt and his wife Tara took excellent care of us, we're so personable and funny and did everything possible to make our stay more comfortable. We were travelling with our kids and they have a fantastic family bungalow with 3 rooms which was perfect for us. The location is beautiful and although not a sandy beach it's crystal clear waters were perfect for swimming and snorkeling. Can't say enough good things about this place! We ended up staying for 6 nights! We loved every moment there ,relaxing by the sea ! For Booking inquirys go to Booking / Inquiry page . wow what can i say ,quite little ,chilled out resort ,with really nice owners . We stayed in a few place on koh chang ,but nothing even come close to this kind of service ! Great snorkeling from the beach ,and fantastic sunsets . Fantastic hosts in this small little resort ! Very relaxed quite ,and loads of shade in the gardens ,for some r&r ! 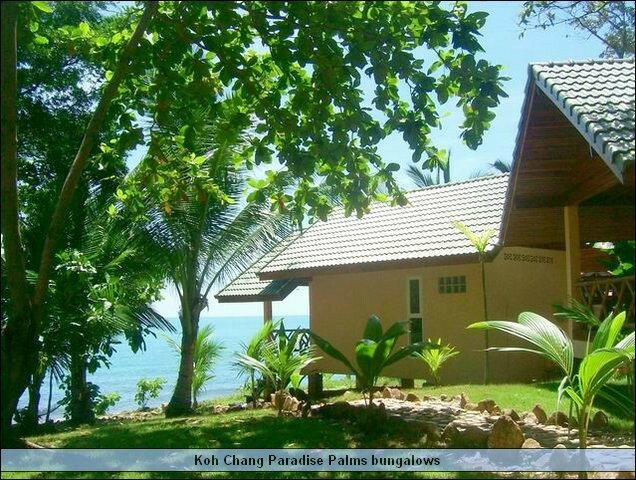 Would recommened paradise palms to anyone comming to koh chang .away from the noisy beaches nearby ! Had a wonderful time at paradise palms ,small .freindly ,family resort ,on the pearl beach ,hadd kai muk . If we ever come back to koh chang ,we will stay ther again . Thanks for all your help and info . Just spent 10 days with matt and tara at there chilled out bungalows .Its was a pleasure hanging with the owners .The sunset were just fantastic ! We had rented a moped and tour around during the day ,to come back to our big, clean, chalet ,and the big comfy bed .We recommend paradise palms for a really relaxed time on koh chang away from all the busy beachs ! Will recommend to all our friends ! we are already thinking how quickly we can get back . This place is cool ! Wow ,had the most amazing time in this small little resort ,the hosts matt ,tara take care of you like old friends . We had the front bungalow ,where we could lay on the bed and watch the sunset .This palce is totally cool ,we just wish we found it earlier . SUNSETS ARE JUST AWESOME ! Paradise Palms was a great choice for me ,quite and relaxed ,but only 5 mins from the white sands beach area ,where there are so many people ,good to see but not stay. The bungalows were good value and clean & fresh ,with great sunset and cold beer. We found this nice little piece of paradise on tripavisor ,and they had such wonderfull reviews ,we had to check it out ! We were not dissapointed , the hosts matt tara are so helpfull with everything! The bungalows are big clean with a great views of the sea ,it was a very relaxing 10 days ,just reading ,eating ,sleeping to the sound of the waves ! We stayed at paradise palms in july ,during the rainy season ,but we had nice weather for the 5 nights there ! Matt & tara were such nice hosts , arranging all our days out ,elephant ,jungle ,treking . Would recommmend for a great buget accomadation . This bugalow is beautiful,good view and good private for relax. Thank you for give the beach front room in last day even the weather it not good but your resort give the happiness when we stay in there. If we have opportunity and free time we will come back again. Thank for your support ka. Unfortunately for us, we did not stay at Paradise Palms, but know that when we have the opportunity to visit Koh Chang again, we most certainly will! Luckily, we had the chance to meet Tara, Matt and their beautiful daughter. The difference between where we stayed and Paradise Palms is this wonderful family - they are the most cordial, helpful, cheerful people ever and will do anything in their power to be of service to their guests. To us, this is of greatest importance. A truly beautiful place has sincerity as its foundation and these owners have built Paradise Palms in just that manner. If a quiet, caring spot is what you'd like, stay here! We had stayed at paradise palms in july ,in the rainy season ,but the weather was ok Matt and tara arranged all our day trips ,and was always around to help us with info . 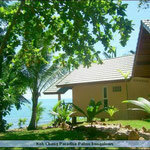 Would recommend if your looking to get away from it all ,in the lovley gardens of paradise palms . We hope to return one day ! Had a wouderful holiday in paradise palms ,stayed with matt ,tara & moksuda for 2 weeks in the family bungalow . We enjoyed the quite atmosphere of the uncrowed litte resort . Had really chilled out time here ,been on the road for 2 months ,needed to relax before going home ,paradise palms is all that ,the hosts matt ,tara ,and there daughter ,moksuda are so sweet ,we will return ! Many thanks Matt and Tara for the wonderful time at your resort. You have the perfect peaceful location and you are so incredibly hospitable. Thank you so very much for the tours you arranged for our family. And special thanks for chartering a fishing trip and coming along with us. That was the best! Thank you! For others reading this guest book, if you want to go to a small place with lots of privacy, Paradise Palms Resort is great. And with the use of the motorbike, you can get to sandy beaches with no problem and come back and relax in your own peaceful get-a-way. I just came back home on 20 Feb. My wife & me have a really really great time in your resort. When I walk into the "Paradise Plams", I saw a beautiful seaview and the bungalow have a great great balcony (especially when sunset). I really like to sit on there and enjoy the beer with my wife. My wife & me walk around in Thailand every year. Finally, I found Koh Chang is the place which I surely will visit again. I feel so upset right now because I have only 6 days stay in Koh Chang & your great resort. Dear Matt, I will come back and fishing with you again and again. Also, I will spend a day to talk and have a beer with you. Dear Tara, thank you very much for your fruit breakfast, it is really great for us. Dear Muksuda, it is great to talk with you, please join us to fishing when I next visit. Hope to see all of you soonest and keep in touch! matt can not make feb 7 sorry about that so i will see you again another time at your great resort cheers mark.